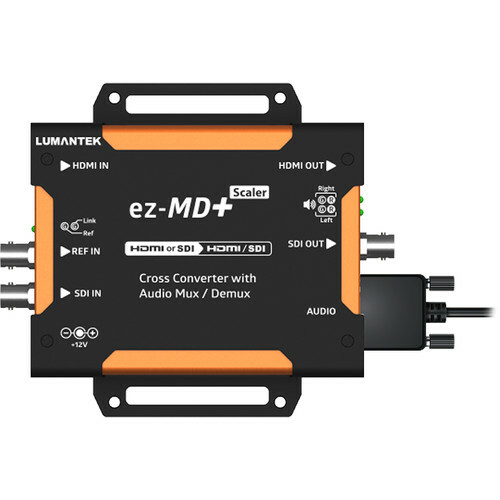 The compact HDMI/SDI Cross Converter from Lumantek converts HDMI to SDI signals or SDI to HDMI signals. The converter can change the resolution of the incoming video to any resolution ranging from 480i to 1080p60 and lets you choose between a 16:9 or 4:3 video displaying ratio. A 9-pin serial port allows embedding and de-embedding of audio with the included external 9-pin to XLR breakout cable. A 10-step rotary switch controls the audio delay of the video source at 50ms steps. There is a Free Running, Input Lock, and Genlock mode to synchronize your video signal. The Genlock system ensures proper synchronizing of the signals when aligning the source with an external signal.